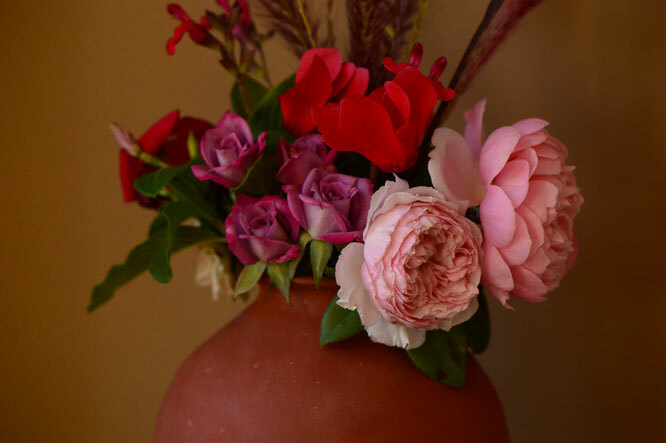 As I looked through the garden yesterday for my belated Bloom Day post, it was clear that The Alnwick Rose would be playing a part in today's vase. 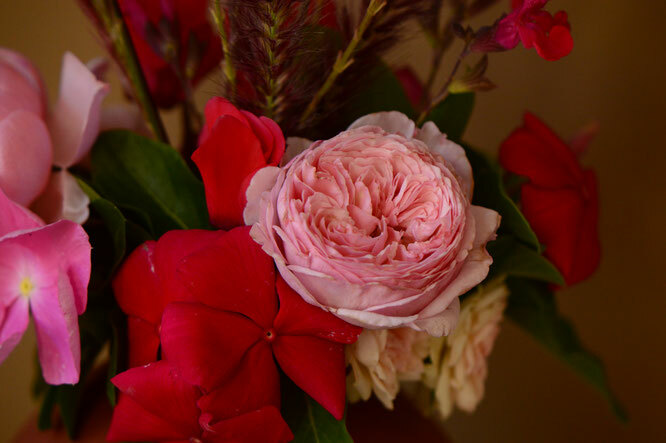 With that as a starting point, it easily became a confection of pink, red, and roses. 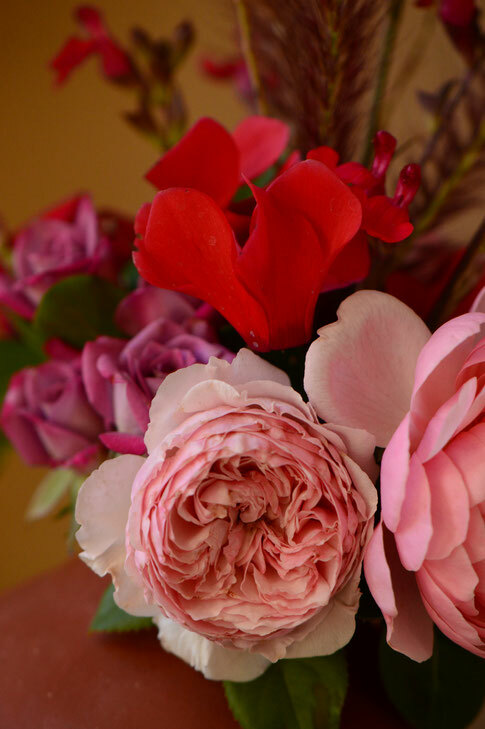 James Galway supplied a couple of luscious blooms, which combined well with flowers from a newly purchased florist's cyclamen. 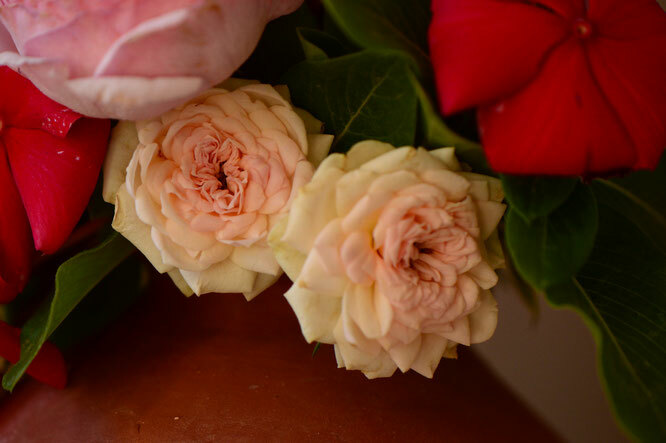 The miniatures are masses of bloom just now, so I cut stems from two of them. 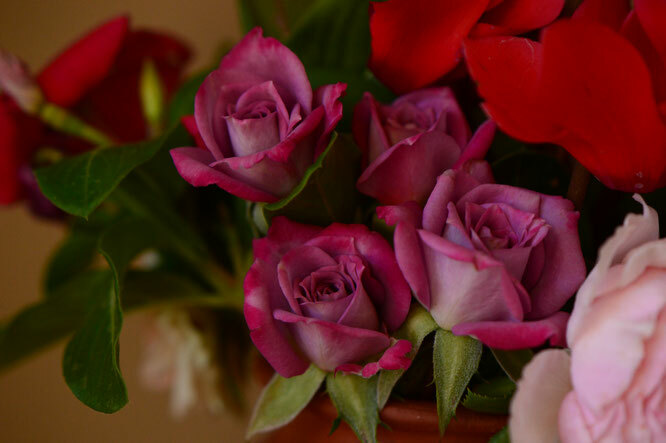 The lavender miniature rose has cherry-brushed petal edges, reminiscent of the hybrid tea "Paradise". The pink and cream miniature has very full-petaled blooms. 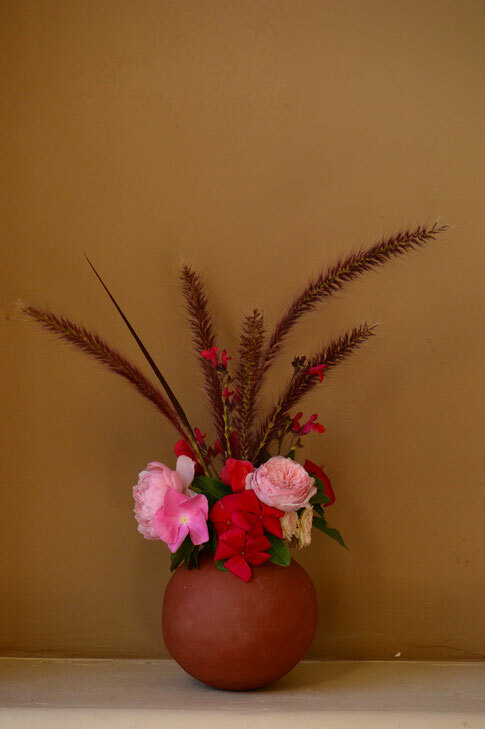 Other components include the ever-useful Catharanthus roseus, along with sprigs from Pennisetum setaceum rubrum and stems of Salvia greggi. I added the Salvia at the last minute, feeling the need for something on long, wiry stems amid the grass plumes. S. greggi usually doesn't last well when cut, but it will do the job for now. 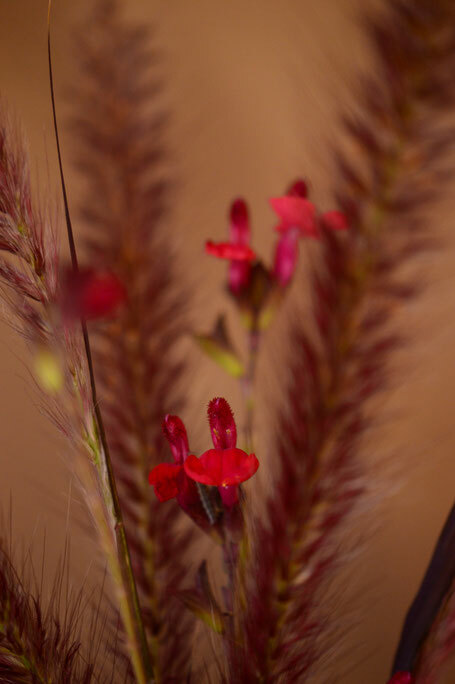 These flowers are from a self-seeded plant. 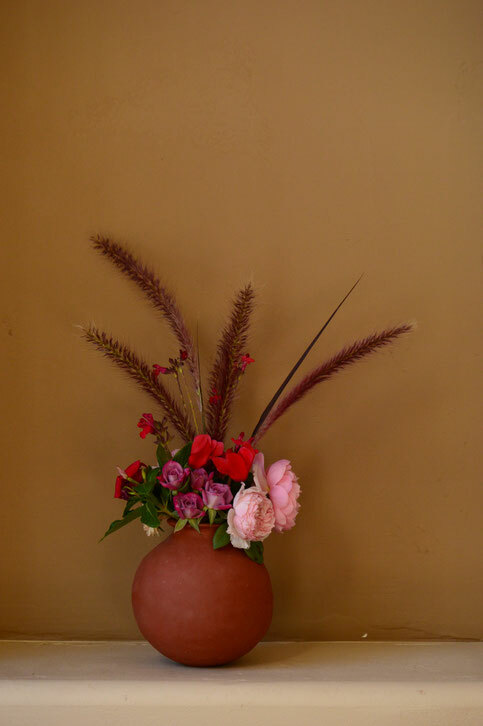 I used one of my favorite handbuilt vases; this one is in a slightly darker clay achieved by adding additional black iron oxide to my usual red clay recipe. As October continues, the garden is full of beauties. 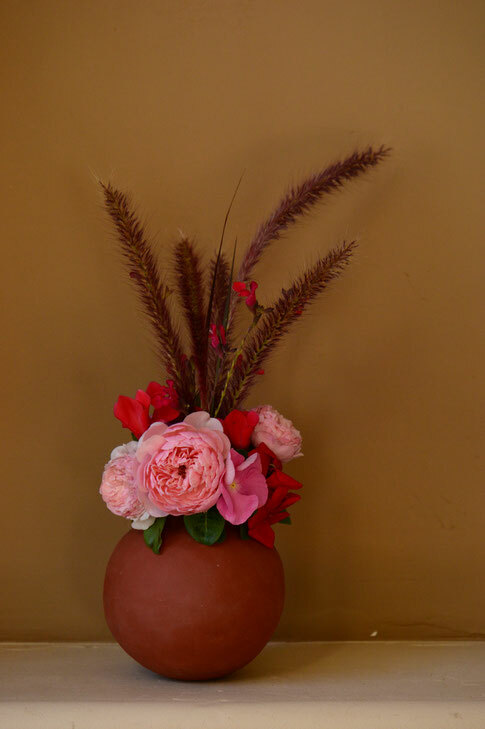 Do check Rambling in the Garden for wonderful October vases from around the world! Gorgeous! You may single-handedly boost the profile of miniature roses with your posts, Amy. Lovely vase Amy (both the flowers and the pot itself - you are so clever to be able to make a pot like that!) I particularly enjoy Pennisetum whenever I see it. 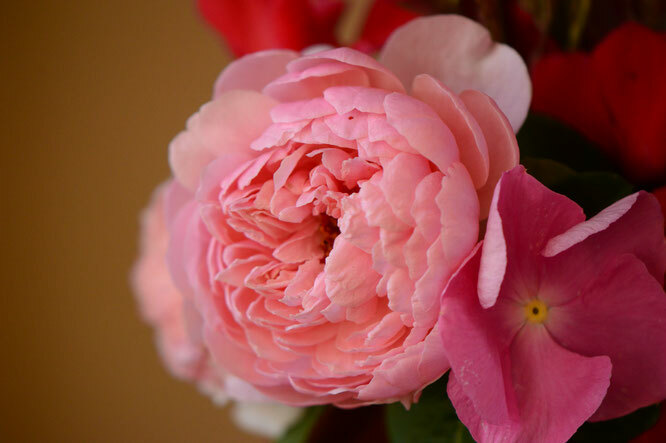 But I wish people would stop showing me more roses to buy - The Alnwick Rose is just stunning. Lovely shape to the flowers. I can't stop with roses (and sometimes I wonder why?) It is lovely to make it to your new blog and I'm sorry I've been so slow. Now that nights are colder, I will become a more faithful follower again! Kris - You never know... ;-) I still can't get over how well they grow for me here, as I had zero success with them in my earlier cold winter, blackspot prone garden. Cathy @ Rambling in the Garden - I have no idea how they do it - a mere hundred petals or so... ;-) The many-petaled roses hold up well to the heat, too; and these are lasting better in the vase than I expected, given they were all a bit dry when cut. Cathy Thompson - It's good to see you again :) and thanks for your reply to my comment! I'm the same way with the roses, but I really can't help it in this case because The Alnwick Rose is so lovely and, besides, it photographs well! Just before we moved here, I fell in love with it in my cousin's garden, along with the deep red William Shakespeare 2000, so they became the two must-have roses for this garden. Unfortunately WS is very difficult with the camera! (It also holds spent blooms, but in every other way it's a wonderful rose.) I've been adventuring into antique roses again, too, but there is only so much space and water available for roses... or so I tell myself! Extra beautiful arrangement, Amy--great pot, colors, shape!